The Prince of Wales recently warned of the “catastrophic” consequences of inaction on issues such as climate change, at the Rio+20 talks. He said he had “watched in despair” at the slow pace of progress on the “critical issues of the day,” and urged world leaders to adopt a more integrated approach to issues such as climate change and food security. He said scientific evidence showed the potential consequences of ignoring the risks, and that the Doomsday clock of climate change is ticking ever faster towards midnight. We are simply not reacting fast enough. Taking up this call, protesters from Climate Siren held a peaceful banner protest, hanging banners from the gates of Buckingham Palace, quoting Charles words – calling for more effective climate action. Climate Activists locked themselves to the top of the gates of Buckingham Palace and displayed slogans including a quote from Prince Charles calling for greater urgency in combating climate change in response to the failure of the Rio Earth Summit. Climate Activists with ‘Climate Emergency banner’ on barriers in front of fountain opposite Buckingham Palace during protest calling for greater urgency in combating climate change in response to the failure of the Rio Earth Summit. I got to the palace a few minutes after the 4 protesters had scaled the gates and locked themselves on. Police were holding back the crowd of tourists and a few photographers as the protest continued. The ‘Climate Siren’ protest had been widely trailed in the press and on a web site as “a great effort of civil disobedience” for today, but without any details as to what it would be or where. Late on Friday evening a Twitter post from ‘Climate Siren’ had given a time for those who wished to take part to meet at Euston station, and I travelled down to the event with the small group I found there, running ahead the last few hundred yards when I saw what was happening on the gates. These protesters had brought a large banner which they fixed on the barriers facing the palace in front of the Victoria Fountain. As I was photographing the protesters on the gates one of the officers reached up and grabbed the bottom of the large banner, managing to tear off the small part naming Prince Charles under his quotation. Encouraged by this he climbed further up the gate and grabbed the whole bottom half of the banner with the Prince’s text and pulled on this. It gave way and he lost his hold, falling to the ground. Fortunately the bottom on which he landed was well padded and he rolled over having hurt little but his pride. One of the protesters on the top of the gate was Phil Thornhill, the coordinator of the Campaign against Climate Change, and he had taken a megaphone up with him, so was able to tell the crowd of tourists who were watching what the protest was about and why it was necessary. In between speaking he used the megaphone as a ‘climate siren’ by generating some extremely loud feedback. I left the protest roughly half an hour after it had begun and there was still no attempt being made to remove the protesters, with a small police presence simply watching them. It wasn’t clear if they were waiting for a specialist cutting team to remove the protesters or simply waiting until they got bored and came down of their own accord. They did however say that the protesters who had climbed the gates would be arrested, and suggested that others involved, including the legal observers who had come with the protesters – and even the photographers – might also be charged. But perhaps the officer speaking was simply rather frustrated and having been outsmarted by the protesters. The Prince of Wales has warned of the “catastrophic” consequences of inaction on issues such as climate change, at a UN sustainability conference in Brazil. 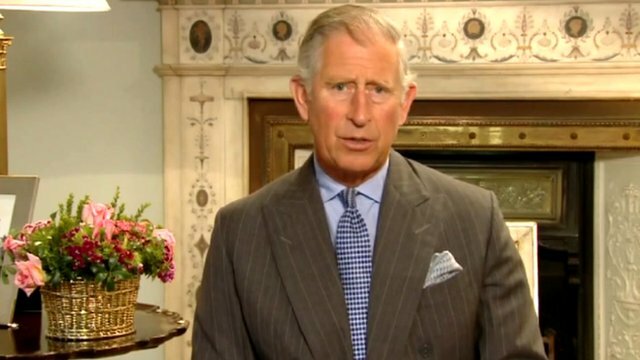 Prince Charles said he had “watched in despair” at the slow pace of progress on the “critical issues of the day,” in a pre-recorded video address in Rio. He urged world leaders to adopt a more integrated approach to issues such as climate change and food security. Waiting for the worst to happen would be “too late to act at all”, he said. Rio+20, the United Nations Conference on Sustainable Development, is attended by heads of state and representatives from governments, non-governmental organisations and the private sector. In his address, the prince said scientific evidence showed the potential consequences of ignoring the risks. “Like a sleepwalker, we seem unable to wake up to the fact that so many of the catastrophic consequences of carrying on with ‘business-as-usual’ are bearing down on us faster than we think, already dragging many millions more people into poverty and dangerously weakening global food, water and energy security for the future,” he said. “One thing is clear. We need to be much more informed about the actual state of the planet. “We do not have nearly enough knowledge on which to base the decisions that will be the best for the long term. He said the “outright, sceptical reluctance” by some to engage with these issues had often slowed progress “to a standstill”. Pointing to the work of his International Sustainability Unit, a foundation set up to campaign on global sustainability, the prince said a better picture of environmental problems was needed before effective policy could be implemented. He said data on energy, water, biodiversity, forestry and soil, which is collected separately, needed to be combined and analysed as a whole. “If this could happen, at least then we would know what the state of the planet actually is – and then plan accordingly,” he said. He went on: “We do not have long to capture such a comprehensive picture, and so I would appeal to you as you meet here in Rio to make an even greater and concerted effort to persuade policy and decision-makers to act before it is finally too late. “It is, perhaps, a trait of human nature to act only when the worst happens, but that is not a trait we can afford to rely on here. The conference marks the 20th anniversary of the 1992 United Nations Conference on Environment and Development, in Rio de Janeiro, Brazil’s second largest city. Posted: Sunday, June 24th, 2012. Filed in Climate Change News, Publicity & Politics, Recent News.